Vernonians are excited to see progress on the beautiful new Vernonia Health Center on the south side of town. Construction has been moving along swiftly through the summer with the new facility scheduled to open this fall. Owned and operated by the non-profit Vernonia Health Board, the new health center will provide a “medical home” where several services can be offered under the same roof. Primary care, provided in partnership with the Public Health Foundation of Columbia County and Pacific University, will continue. The Health Board is planning to add mental and behavioral health and physical therapy in the near future and is exploring other support services that will benefit their patients and the community. The new construction was fully funded with generous support from Meyer Memorial Trust, the Ford Family Foundation, Collins Foundation, Oregon Community Foundation, Samuel S. Johnson Foundation, funds from Providence, their FEMA buyout, and many donations from community members to the Carolyn Keasey Memorial Fund. The Health Board is happy to be able to provide service five days a week for their patients under primary care provider Albert Rodriguez. Additionally, the partnership with the Public Health Foundation allows a seamless transition so students seen at the student based health center, Spencer Health and Wellness, may also be seen at the Vernonia Health Center. The clinic accepts the Oregon Health Plan (Medicaid), Medicare, and a majority of private insurance. For those without insurance, the clinic has staff on site to walk you through the healthcare application process and they have a sliding fee scale for eligible patients waiting for approval. A grand opening celebration is just around the corner and is another indication that Vernonia is continuing to move forward and grow as a community. Oregon is well known internationally as a bicycling destination. Located in its scenic northwest corner, Vernonia continues to attract its share of those cyclists who are finding the local Banks-Vernonia State Linear Trail to be the perfect excursion. 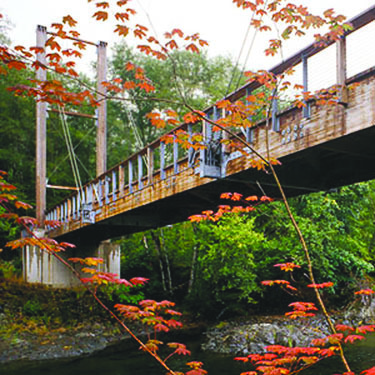 This past summer Vernonia enjoyed an influx of visitors, many who traveled up the tree lined and paved trail from Washington County and L.L. Stub Stewart State Park to visit this little town. Others started right here in Vernonia and contributed to its growing reputation as a cycling hub for both local and visiting riders alike. Any season of the year will find riders of all ages scattered along the trail, enjoying the scenery, fresh air, and solitude. The trail is not just for cyclists. Hikers, runners, and horseback riders also congregate on this multi-use pathway. 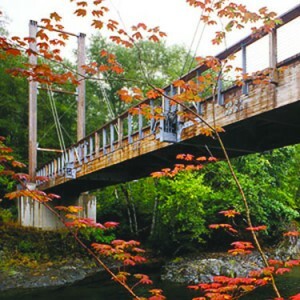 Managed and maintained by Oregon State Parks, the trail was the first Rails-to-Trails project in the state of Oregon. It has an easy grade with thirteen bridges, including the scenic Buxton trestle. The trail can be accessed at any of 6 points along its progression – including trailheads at Manning, Buxton, Tophill, and Beaver Creek, as well as in Banks and Vernonia. Many cyclists have discovered the joy of riding to Vernonia in the morning, stopping off for a bite to eat at one of several eclectic downtown restaurants, before heading back down the trail towards home. 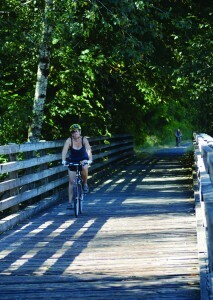 The trail was extended last year by the addition of the newly established Tualatin Valley Scenic Bikeway. In 2013 the Oregon State Parks and Recreation Commission formally approved the Tualatin Valley Scenic Bikeway as the tenth designated bikeway in the state, cementing the region as one of the top spots to cycle in Oregon. 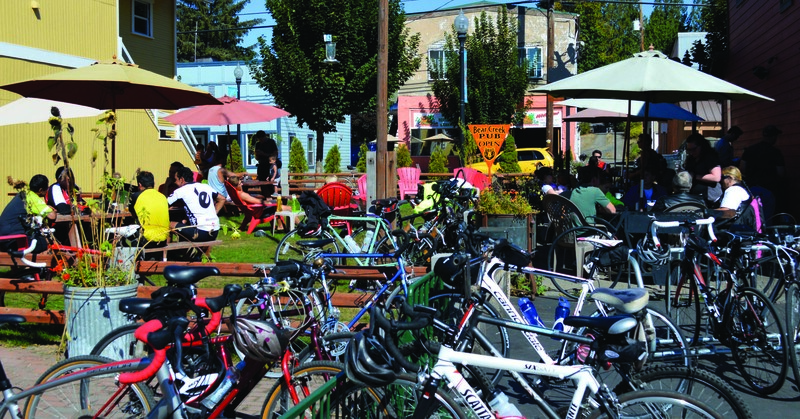 The bikeway features the best of the northern Willamette Valley, from friendly downtowns to fertile farmlands and lush natural areas. 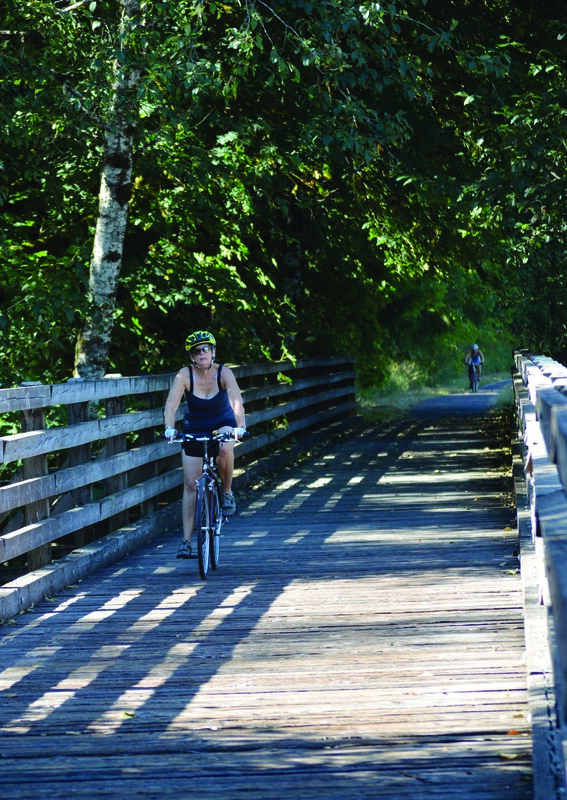 Set in the heart of Washington County and traveling into Columbia County, the Bikeway runs for 30 miles one way, and connects in Banks with the Banks-Vernonia State Trail. From the trailhead in Hillsboro, the Tualatin Valley Bikeway travels on mostly rural roads. The middle portion of the Banks-Vernonia Linear Trail travels through lush forests including a portion of Stub Stewart State Park and features a gentle climb of about 600 feet. Overall the Scenic Bikeway is rated as a moderately challenging ride and can be enjoyed by a wide range of cyclists. With the route’s layout, cyclists have many overnight options for multi-day rides, while day trips covering sub-sections of the route are easy, too. Stub Stewart State Park offers full hook up RV camping, as well as primitive campsites. Vernonia’s Anderson Park, which serves as the trail head in Vernonia, is a full RV park with showers and flush toilets, but also offers primitive tent camping along the Nehalem River. Vernonia Lake and Airport Park in Vernonia offer primitive camping. 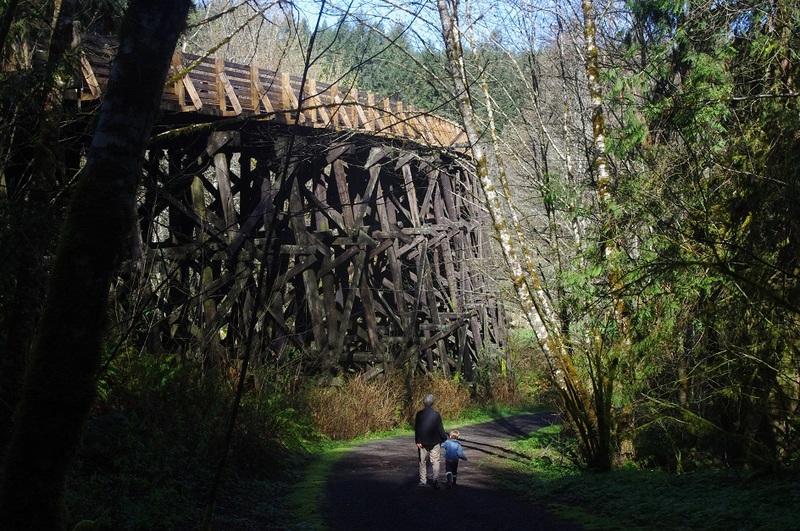 Paved trails in and around Vernonia give families a chance to ride together as well. The connection from the Banks-Vernonia Trail to Webb Way at Anderson Park is a flat and easy ride for even the youngest cyclists and takes riders to scenic Vernonia Lake. For mountain bikes enthusiasts, Stub Stewart State Park, just 10 miles south of Vernonia, has a new Free Ride Skills Area that is open to the public. A session/training area includes options for beginner to advanced Free Ride mountain bikers. Initial construction has focused on beginner and intermediate level trails but construction in the area is ongoing. 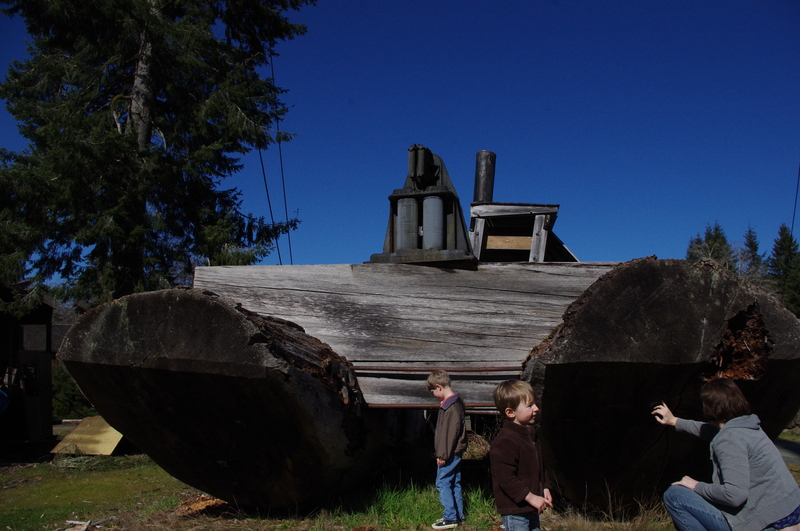 For others looking to explore more of the outdoors, the Vernonia region is literally covered with logging roads, many of which are open to the public for limited recreational use. As you can see, it’s no wonder Vernonia is becoming a destination for bicycle riders as well as other trail users who want to enjoy the great outdoors. As the economy slowly continues to improve, there are many positive signs that the recovery may finally be reaching Vernonia. 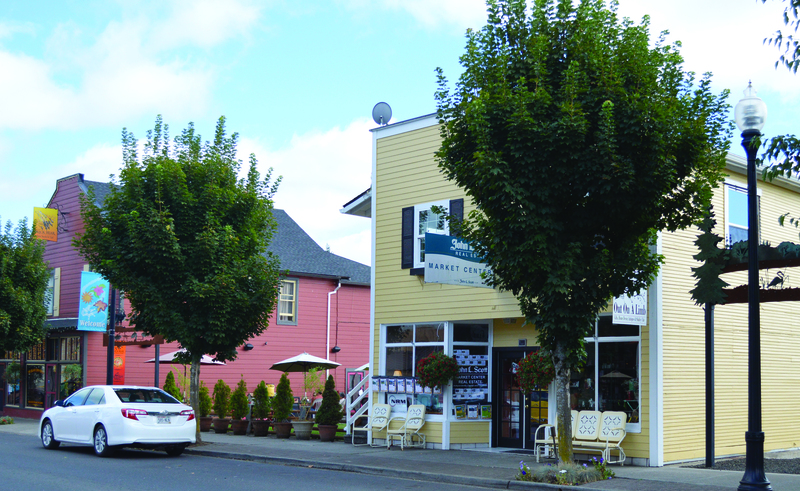 Numerous signs indicate things are looking up around Vernonia, with local business owners reinvesting in their businesses by expanding or refurbishing. Sharon Bernal is a local resident and real estate agent for John L. Scott. Bernal recently purchased the building where her office is currently located on Bridge Street In the space next door, she re-opened ‘Out on a Limb,’ a gift shop which carries cards, decorations, crafts and gifts with a country theme. Bernal is re-roofing and painting her building, along with remodeling its three apartments. Bernal says the real estate market continues to rebound and is particularly strong in Vernonia. “We have a lot of people from Intel who are looking to live in a small community that is half an hour from where they work,” says Bernal. “And many of them are younger families with kids. And I have to tell you, every person who comes into Vernonia just thinks it’s great. They absolutely love it! Vernonia has something to look forward to this fall as word has spread that the former Vernonia Inn is being renovated. New owner, Jerry Cordell, along with his business associates, brothers Elmer and Santos Rivas, have begun work on the fifteen room lodge renamed the Ride Inn. Cordell says plans call for a complete rehabilitation to the building with a grand opening tentatively scheduled for October 1, 2014. Cordell and his partners had previously purchased the old Masonic Lodge in Vernonia and are currently renovating it. That building will likely be a six room up-scale bed and breakfast. Cordell says the name Ride Inn is specifically to help tap into the potential customer base of bicycle, motorcycle and other tourists who visit or pass through Vernonia. Dana Roach is the owner of The Black Iron Grille, formerly known as Black Bear Coffee and the Bear Creek Pub. Roach recently did a major kitchen renovation, adding a grill and hood which has allowed him to expand his menu as well as his staff. A favorite spot for visitors, especially tourists on bicycles, Roach expanded his outdoor seating area last year and added additional bicycle parking. Roach says he is betting on Vernonia becoming more of a destination. “I’m very excited about the future of this community,” says Roach. Photo Solutions is a small manufacturing firm servicing global high tech industries and is one of the only light industry businesses in Vernonia. Owner Brad Curtis recently took advantage of Vernonia’s inclusion in the South Columbia County Enterprise Zone and expanded his business by purchasing $200,000 of new equipment. “I see a lot of possibilities for firms to do business out here, especially for businesses where location doesn’t matter.” says Curtis. “The enterprise zone expansion helps level the playing field.” Curtis’s manufacturing plant was damaged in the 2007 flood and incentives available through the Enterprise Zone may allow him to move his business to higher ground at the California Avenue industrial site currently under development in Vernonia. Planning a trip to Vernonia? Why not stay for a few days and take in one or more local attractions Here are several family friendly trips that are just about an hour from Vernonia. You’ll have a fun adventure-and be back in time for dinner! Jewell Meadows Wildlife Area–See majestic Roosevelt Elk in their natural habitat in the Oregon coast Range. This 2,940 acre preserve is home to well over 200 elk that spend the winter and spring in the lower meadows along the highway feeding and resting. There are two parking areas, four viewing areas and interpretive signs. 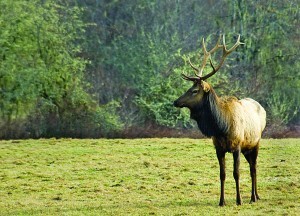 The elk are the main attraction but the area is also a great spot for birding and other wildlife viewing. Travel time from Vernonia: 52 minutes. Distance 39 miles. 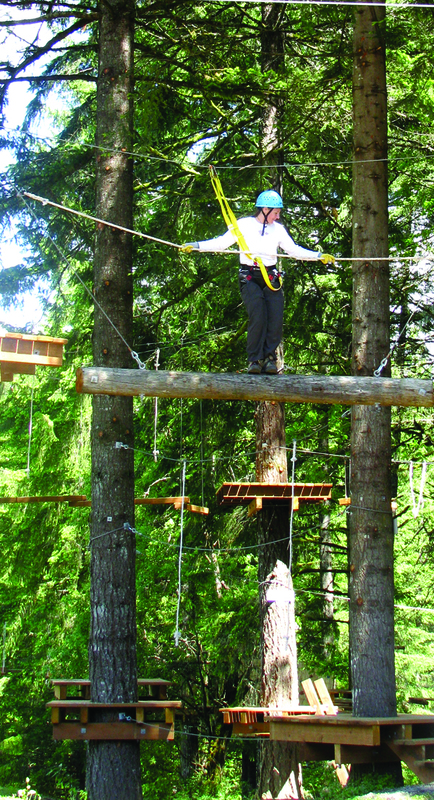 Tree to Tree Aerial Adventure Park–Voted on of the Top 10 Zip Parks in the country, Tree to Tree offers an Ariel Adventure Park with six colored levels graduating in height and difficulty and over sixty extreme obstacles. There’s a level for just about every member of the family including a tween and children’s course. In addition take a separate zip line tour which includes a 1200′ single line as part of the adventure. Reservations are required for all adventures. place to explore. 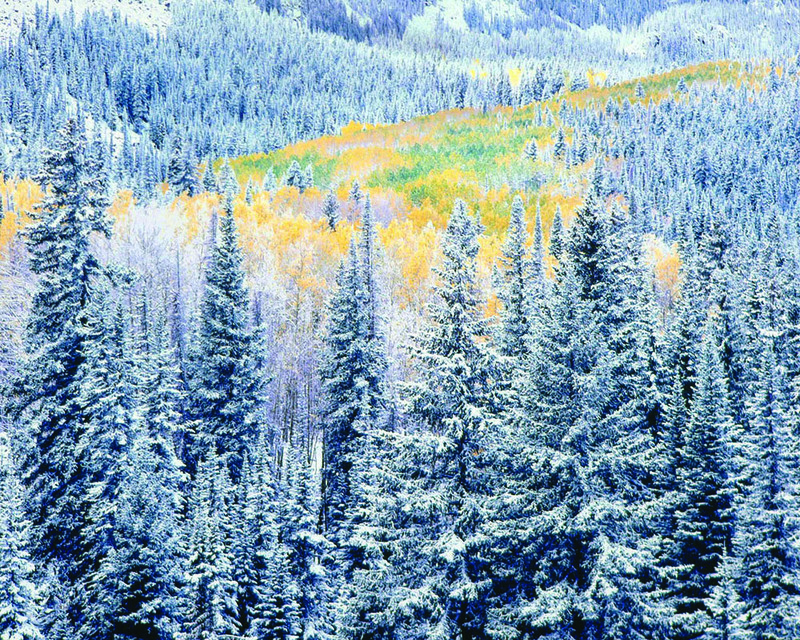 Learn about forest history, wildfires or sustainable forestry practices inside the center. 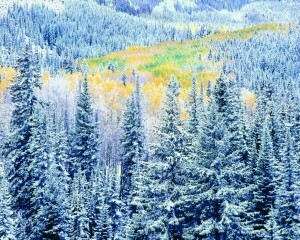 Hike through the forest and see it for yourself—make sure to dress appropriately for Oregon weather. Highlights include the climbable 40 foot high lookout tower replica, a 250 foot suspension bridge crossing the Wilson River, connections to a host of trails, hands on exhibits and the award winning film Legacy of Fire. Hours change seasonally—the Center is closed December through February; open Wednesday through Sunday in fall and spring; open seven days a week in summer. Admission is free. Travel time from Vernonia 57 minutes. Distance 38 miles. Camp 18 Restaurant and Logging Museum–For anyone interested in the logging and railroad history of this region, or just history in general, Camp 18 is a must go! Wander the grounds and be fascinated by the outdoor displays of huge, heavy equipment. See a Steam Donkey, a Spar Tree, a real wood-sided caboose on tracks, a large band saw and much more. Visit the Logger’s Memorial and see the displays family members have created for their lost loggers. When you’ve finished your outdoor tour, step inside the restaurant and be amazed by the size of the log beams used to construct the massive building. The Oregon coast is just another 18 miles on Hwy 26. 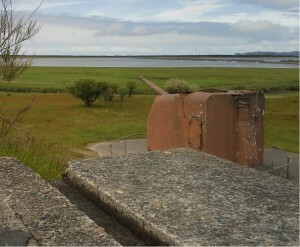 Fort Clatsop and Fort Stevens–These two historic forts are located on the Oregon Coast near Astoria. Fort Clatsop is part of the Lewis and Clark National Historic Park and was the winter encampment of the Corps of Discovery from December of 1805 to March of 1806. You can explore the replica of Fort Clatsop where Lewis and Clark spent a cold and wet winter with their men. Visit the interpretive center and view two different films to learn more about the explorers of the west. Fort Stevens, part of the Oregon State park system, was the primary defense installation at the mouth of the Columbia River from the Civil War through World War II. Explore history, nature and enjoy recreational opportunities in this 4,200 acre park. Bring your bikes—there’s six miles of paved trails providing easy riding for everyone. A visitor to Vernonia might be surprised by the quality of the small but enthusiastic art scene this community has carved out. Not only was Vernonia the one time home to Christopher Burkett, considered by many to be the greatest color landscape photographer alive, it also has a non-profit community group, the Vernonia Hands On Art Center, dedicated to promoting the arts and heritage of Vernonia. Additionally, young artists are discovering their artistic talent through Artist-in-Residence Kerri Boutwell and the Grace Fine Arts academy she has established. The annual Salmon Festival, held the first Saturday in October, is a great opportunity to see the work of local artists; this year the Salmon festival will include the work of Boutwell and others. In other words, the arts are alive and well in Vernonia. Any visit to Vernonia certainly must include a visit to Grey Dawn Gallery, which features some of the finest in northwest art. 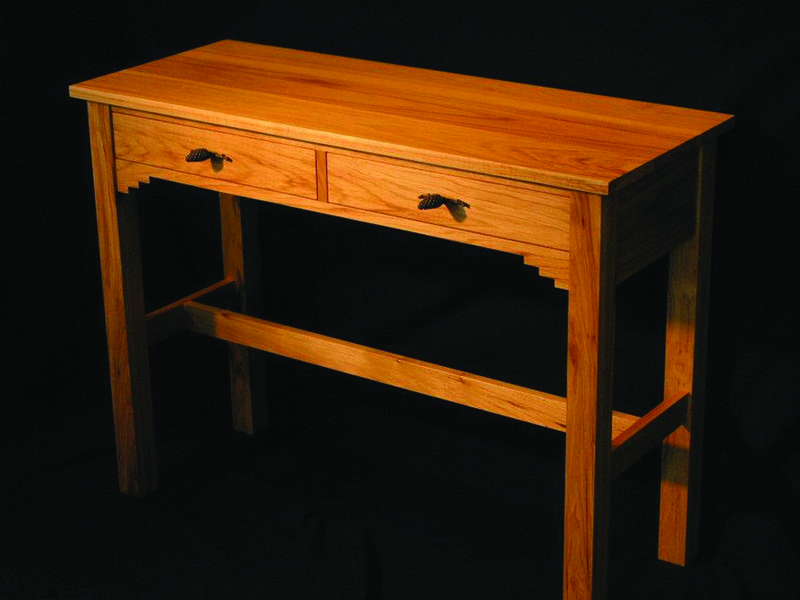 The gallery is owned by Dan and Heidi Brown and includes, in addition to Burkett’s work, Dan Brown’s own Hardwood Originals custom wood furniture. 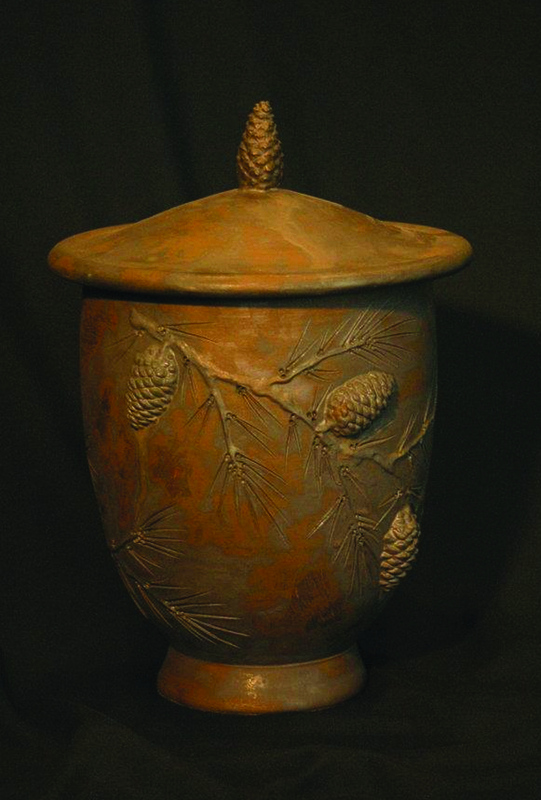 The gallery also features artistic pottery by Jeff Patterson, also a former Vernonia resident, as well as the bronze sculpture work of Jacques and Mary Regat. 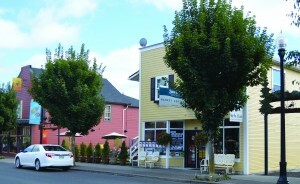 The Browns established their business in 1991 and moved it to their hometown of Vernonia in 2000 to a custom designed building at 879 Bridge Street they designed themselves. The front is home to the gallery while the back contains the workshop where Dan designs and builds his locally famous “Dan Brown Kitchens” and other fine furniture. The Browns also do custom framing for the art work they sell. system of sophisticated masking techniques over thirty years, hand making each individual print without the use of digital or computer enhancement, creating a unique and individual piece of art work. Burkett signs and numbers each of the three sizes of prints he produces and therefore controls the number of prints released to the public, usually in the low hundreds. His work has been displayed in galleries worldwide, including the Smithsonian Institute in Washington, D.C., and has been compared to the work of the great Ansel Adams. “Christopher’s work has, beyond a shadow of a doubt been the main reason we have remained in business over the years,” says Brown. “He has a world-wide reputation and we ship his work all over the U.S. and abroad.” Brown notes that their custom framing work has made them a sought-out source of Burkett’s limited edition work. 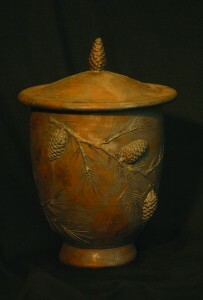 In addition to Burkett’s work, Grey Dawn Gallery continues to show a small collection of Jeff Patterson’s work. He is no longer producing his fine art pottery. “We were sorry to see Jeff stop working,” says Brown. 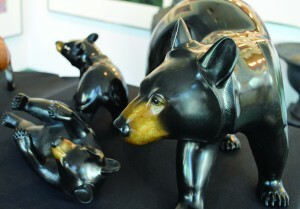 The bronze work of Anchorage, Alaska based Jacques and Mary Regat is focused on wildlife. The inclusion of the Regat’s work allows Grey Dawn Gallery to display and sell some of the finest regional art, and makes the gallery a must visit for anyone interested in seeing some beautiful creations. Kerri Boutwell and the other instructors at Grace Fine Arts offer after-school classes in acrylic painting, sculpture, drawing, and watercolor. Boutwell also conducts workshops for adults. She has held two art shows locally, displaying the surprisingly impressive work of her youth students. Her instructional classes have been fun and popular and have uncovered some artists who have found talents they were unaware they possessed. 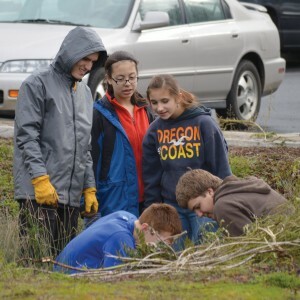 Grace Fine Arts is encouraging a new generation to appreciate and participate in the arts in Vernonia. 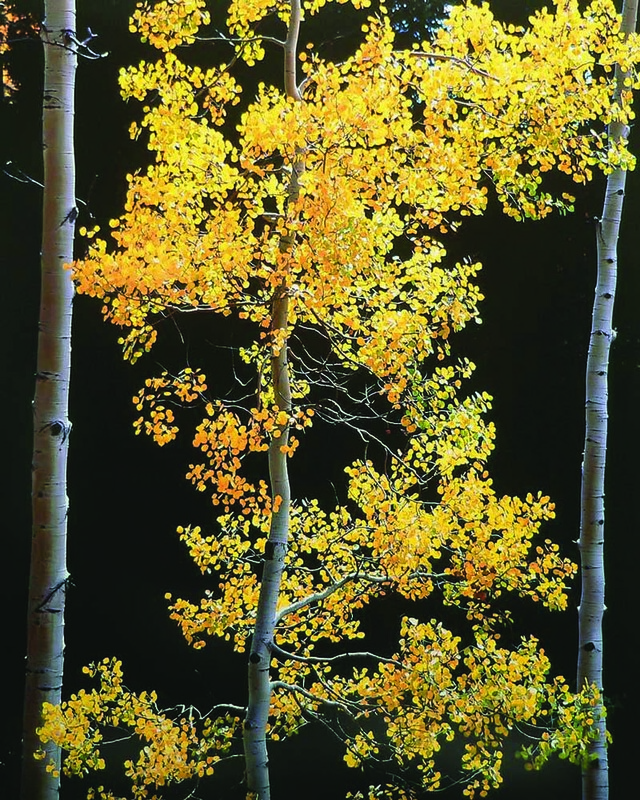 Alongside Boutwell at Salmon Festival will be local realist Randal Harvey, potter Wanda Aszman, and Nicole Gray, who specializes in photographic portraiture and local landscapes. 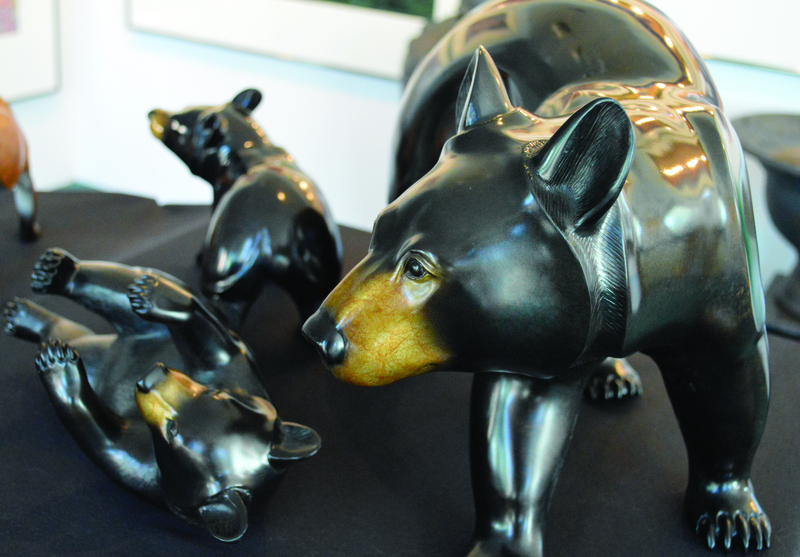 Coined “Art in the Woods”, this event showcases local artists but also hosts a salmon-themed art auction which funds art scholarships for local youth. 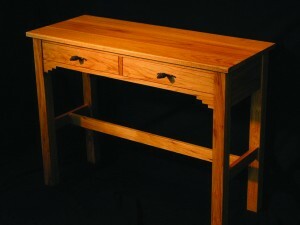 In 2014 the inaugural scholarship was awarded. It is the first local scholarship offered to students interested in exploring the arts. The Vernonia Hands On Art Center has been encouraging the Vernonia art scene through its volunteer and financial support of various artistic endeavors within the community. Hands On Art has supported community theater, the Vernonia Ballet, First Friday gatherings and the Vernonia Salmon Festival. Hands On Art has been encouraging learning environments with financial grants, advertising assistance and volunteer manpower since 1997, continually helping to raise awareness of the arts in Vernonia.